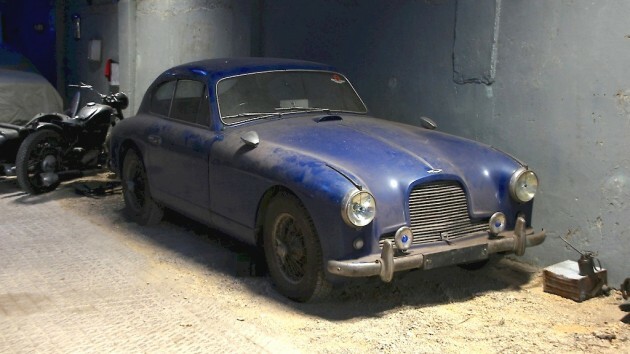 Imagine swinging open the doors to an old barn to find this beautiful Aston Martin DB2/4 just sitting there on blocks waiting to be put back on the road. Well that was the experience one lucky car guy had when he got a tip about this Aston barn find! 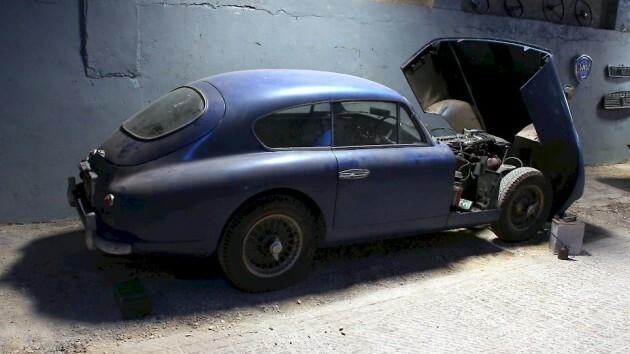 Now not only is this a rare DB2/4 model, but it also has an interesting story behind it! You see, this car may have been put to work sometime in the ’60s as an unmarked police car. If they start giving police unmarked Aston Martins for patrol cars, I might have to think about a career change! This incredible find was discovered in Gloucester, England where it had been hiding for the past 50 years. 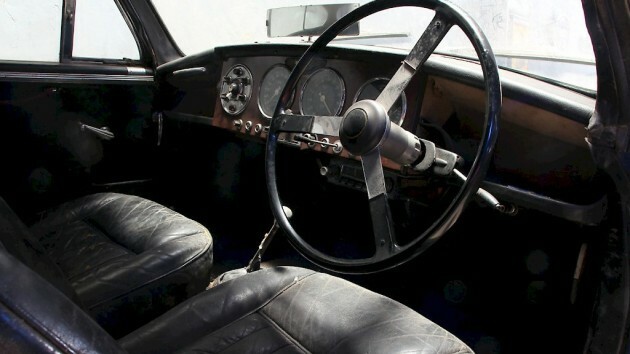 Incredibly, the car has survived with minimal rust and even still has some old newspapers sitting in the back. Apparently this wasn’t your regular old barn, but was heated in the winter and well maintained. 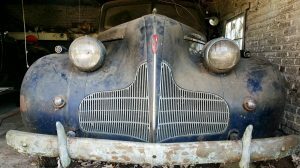 It did a great job at preserving this car and I can’t help but wonder what else is in there! Wouldn’t it be fantastic to just look at and study this car up close? I can’t even imagine being a police officer in the ’60s and being assigned this as your patrol car. I would have wanted to use it after hours too, but I have a feeling that might have been frowned upon, especially when I got pulled over by a fellow officer for speeding! Think how cool you would feel pulling people over with it, especially with a leather jacket and aviator sunglasses on. This car is currently in the care of Jonathan Wills from Cotswold Classic Cars, who specializes in restoring high end European classics. 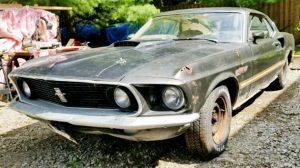 It sounds like it is in good hands, but sadly it is likely destined to be fully restored. I would love to see it preserved rather than restored, but sadly that isn’t my call to make. With any luck the next owner will simply fix the blown headgasket and get it back on the road again. Now if it were my car, the first thing I would be doing is digging into the car’s history. At this point, the tie to being an undercover police car is just speculation and will need to be investigated to be proven. I sure hope it was though, as that would be an incredible story! Whether or not it was used for police duty, this is one amazing car and is worth considerable amounts of money. The DB2/4 is one of my favorite AM designs and while it doesn’t have any ties to James Bond (that was the DB5), it still has the iconic look that most people will recognize. I know I would feel like a secret agent every time I climbed in it, especially with a black suite and some leather gloves on! So have any of you heard of Aston Martins being used as police cars? Special thanks to our buddies over at BoldRide for letting us know about this fantastic find! Very nice just the way it is. There is a DB6, I believe a 66 or 67 model sitting outside next to some old guy (at least in his 80’s) garage for many years. It just sits, no cover, flat tires ect. Many people including myself have knocked on the door looking to buy it but in his normal rude way, says “not for sale at any price” and shuts the door while you are still talking. The last time I drove past which was some time ago, he had a fresh no trespassing sign posted on the tree next to the car as to punish us all a little more. Nice guy right? The fact that each time I knocked on the door, he had several large dogs barking behind him never helped. I peaked in the garage window and saw a very dusty early 60s Impala convertible, also with all flat tires, inside so I guess he thought the Chevy should get the garage over the DB6…. You should approach him by saying you aren’t interested in buying but was wondering if he could give you the story behind the car, the history, etc. You might get further than you think. Sounds to me like you’re being kind of a pest. 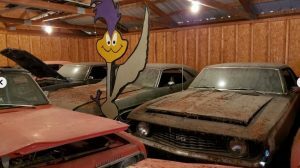 “Peeking” in his garage? You understand, thieves do that kind of thing too. I’m just saying. Maybe you should leave the guy alone. He probably holds on to the car because it’s his last link to a better time, and so priceless. Oh stop it already Steve. Everyone in the area knew about the car and everyone into cars tried to buy the thing and talk to this guy. If you saw a car like that sitting in someone’s driveway, don’t tell me you would not stop in and ask about it because you know you would and so would everyone else here. The walkway to the front door goes right past the garage window so you can not help seeing what is parked in the garage. I went there only 3 times in over 20 years. I don’t think that is being a “Pest” as you said…. Dave, your way is just what I tried to do at my first visit. I just wanted to say hello and tell him I liked his car but told me to go screw. He did the same thing to everyone else who went there. I’m not even sure if the car is there anymore, nor do I care because he was meaner than mean. Maybe he was just alone too much and just wanted someone to talk to which we could understand but he sure did not show it acting like that. What a cool looking ride ! Wow ! The British Police did use odd-ball vehicles from time to time. I bought a Series lll Sunbeam Rapier with a heavily modified engine. It had a tubular exhaust header and a tubular intake with the twin carbs side by side instead of inline. One could see the 3 bolt holes in the roof where the blue lamp was attached and another for the antenna. The car was originally owned and operated by Southend Police to allegedly trap speeders on the local divided highways. The only external mods were the plain dog dish Hillman Minx type hubcaps instead of the Rapier’s regular full wheel covers, and the non factory dark red roof and black body color scheme. Probably found the Rapier’s grip-on style hubcaps flew off too many times during high speed cornering. The Brit bobbies did use some high performance cars over the years, I recall Wolseley, Jaguar and Jensen Interceptors along with Cortinas and Anglias. Seems I have seen 300SL’s fitted with signage and lights and Porsche. The French liked the Citroen DS-19’s. i wonder what is under the car covers and what kind of motocycle that is. this car is going to bring a ton of money. i love the spare spark plugs and crank handle clipped to the firewall. great find. I like the picture that shows the hood up, the extra spark plugs clipped to the upper fire wall. I am guessing with the fuel types of England when this car came out it was not un-common to foul out your plugs on occasion, so carry a spare set where you can get to them fairly easy. Nah, it wasn’t a problem of poor fuel in the UK, the car was equipped with Lucas spark plugs & ignition — ’nuff said! My brother had a DB2/4 back in the middle-60’s. It was French blue and perfect. Perfect, that is, until he managed to break the crankshaft. Those cranks are machined from a single billet and were extremely expensive. 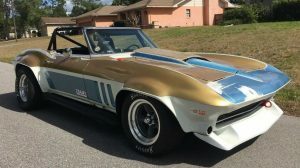 Sacrelidge of sacrelidges – he replaced the engine with a Corvette. 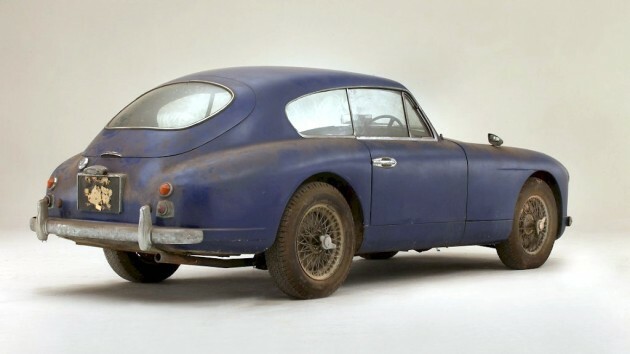 Not sure about the police connection, yes – we had a few Daimler Dart SP250’s, Triumph TR4’s, possibly a Sunbeam Tiger or two, but I’ve never heard of an Aston Martin DB2/4 being in the hands of ‘Old Bill’. Could be that the blue reflector cones of the front mounted spotlights gave rise to the myth? That’s what I’m thinking Roger. There doesn’t seem to be any documentation to back the claim and I would think that would be something that would have been documented somewhere. Don’t get me wrong, I sure hope it was used by the police, simply because it would have been the coolest patrol car ever! Sweet car. Just leave it as it is, it’s only this way once. Anybody with enough cash can restore to perfection. Is that the dealer ad pic or magazine that picture looked as staged as hell? Lighting is perfect, it is super, super clear, oil can in front it. This car will sell for over $250K. Would love to see it sympathetically restored, buff the paint, get it sorted mechanically and maybe if needed replate the bumpers. $250K all day, have seen worse sell for more. I agree that the photos are staged. I noticed right away. The oil can moves from one side to the other in the pics. Still a great car but it sure wasn’t found there. I’m guessing the oil can got moved so they could lift the bonnet up. If they had left it where it was, I think the headlight would have hit it and the box it was sitting on. Now the lighting on the other hand is definitely not natural! Pretty rare find, but old Astons like this one seem to come out of lockups every so often. I see that Cotswold has it for sale with the price “POA”, which translates to “If you have to ask, you can’t afford it”. The SCM Guide says that recent median auction prices have been about $225K, but I think Ross is right—these have advanced since those prices were compiled. Astons are notoriously expensive to restore properly, even if you don’t send it back to the works, and if you did it would be spectacularly expensive. And with head gasket failure 40 years ago being the reason it was put away, it could be a big risk to take this car on because of the possibility of damage to the engine 40 years ago or locking of the engine after 40 years. If I wanted one of these I don’t think this is the car I would take on. The seller says the car was featured in the November issue of Classic and Sports Car magazine, so there should be much more detail there. A good friend of mine has two pre-60’s Astons, one a drophead. Did engine rebuilds on both. Lot more going on in that motor than a Jaguar XK. DOHC is about the only thing they have in common. That aluminum block, along with the twin plug heads a whole other level of sophistication. 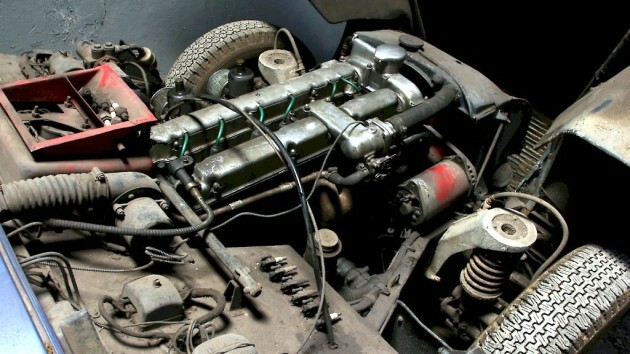 Understand why the DB3S best Ferrari, it deserved to in light of its power with 6 less cylinders. Staged pics for sure as the car has been rolled forward for the second picture. Looks like one to preserve to me. Thanks for all the great info! I’ve seen a number of Astons, but I’ve never had a chance to work on one, so my technical knowledge about them is pretty limited. It’s always great to hear from someone that knows more about them, I love to learn! While I agree, this car is probably going to need a huge amount of money invested into it, I think the old worn look it has is cool. Of course that is assuming there isn’t any structural corrosion, which as you pointed out is unlikely. Aluminum paired with steel is typically a bad idea and can cause major corrosion where the two meet. I’d like to think this one could just be cleaned up and left alone cosmetically, but if there is rust underneath it will definitely need to be addressed. A servivor needs the carb rebuild, fluids changed, and a good cleaning. Rust and engine damage are not servivor conditions. BarnFind, George Washington’s horse, clean his hooves, give him oats and watch those old bones run. Van, can’t say I agree. have seen many a survivor, get its engine pulled, rebuilt and the hydraulics refreshed with new. The cathodic reaction between steel and alloy is real but you need multiple cycles of moisture and drying for damage to occur, think aircraft. This car looks to have been treated very well in its storage. A sympathetic restoration means bringing systems back into operational order and on rare occasions some receive spot touch up of a painted area that needs attention. It is a far cry from plugs, points, flush the tank and clean the connections with a new battery. Cars are only original once. I dare say even now, with Mercedes, Ferrari and other companies doing restorations, they can’t honestly say the cars are more original than they were in their heyday. Takes a different type of person to show both the restraint and have the deep pockets to do helm a proper sympathetic restoration. Mr. Simeone, the founder of the museum in his name wrote a book on this very issue, and is worth the read, preferably before a Museum visit so the gravity of what you are about to witness is properly understood as you gaze upon the vehicles within the facility. Try to attend one of the outdoor events if possible. Back in the late 70s we had a Ferrari 275 come in for door corrosion repairs as the outer skin was aluminum but the door frame was steel. With the door skin edges wrapped around the edges of the inner panels, only 12 years later the corrosion was clearly evident. We made new skins, then used a thin Mylar strip between the 2 dissimilar metals before wrapping the edge, along with a sealer primer. Bill, condensation is always an issue on aluminum bodied cars. Reason seem to be linked to using alum for lightness seems to preclude using any undercoating, paint, etc. How did you like the Mylar? What thickness? Have used Teflon strips, .030 and .060 depending on where and what it was mated to for structure. Structural adhesive works well if you drill a couple holes in the Teflon, you can place the Teflon, let it dry and it stays in place while finishing and affecting the panel. Used to work with an old-timer that used copper. His reasoning was based on the reaction being less. I probably painted the worst picture but the fact that this car was laid up with a “suggested” blown head gasket tells me (with my knowledge of Feltham Astons) that it’s almost certainly not the gasket but cracks and leaks in the block and head. I hope it gets repaired properly and put back on the road.